Preservationists are reaching out to the public for help in saving the Kincaid house in Fishers. Nickel Plate Arts studio and the Noblesville Preservation Alliance launched a crowdfunding campaign on Friday to relocate the 153-year-old farmhouse, which sits on the corner of 106th Street and Kincaid Drive. Advocates are looking for about $115,000 to fund the relocation of the house, considered historically significant, to the west side of Sallie Mae spin-off Navient&apos;s campus, half a mile away. They&apos;ve raised half of their goal through donation pledges from the Hamilton County Tourism agency and Thompson Thrift, the development firm that owns the land on 106th Street and Kincaid Drive. "The Noblesville Preservation Alliance is making history by saving history," Ailithir McGill, Nickel Plate Arts&apos; director, said in a statement. 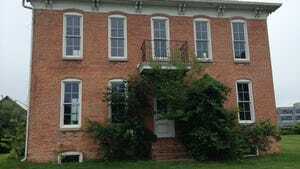 "After partnering with them to save the Judge Stone House in Noblesville, we&apos;re excited to work together again to give this Hamilton County historical landmark a new home." The property was once owned by Gen. Thomas Armstrong Morris, a key player in building Indiana&apos;s railroad and canal systems, and the state capital. Loma E. Kincaid, who founded Kincaid&apos;s meat market, later purchased the property and passed it down to Dan Kincaid before it was sold to Thompson Thrift. Members of the Noblesville Preservation Alliance, Indiana Landmarks and other local groups stopped Thompson Thrift demolishing the farmhouse in June. The firm agreed to hold off if preservationists could find a new place for the farmhouse and relocate it. Contributors in Hamilton County have surfaced to help. Navient announced Aug. 15 that it would donate a two-acre stretch of land for the house. Indiana Landmarks offered a $2,500 grant to consult on landscaping and construction options for the property once it is relocated and Peterson Architecture, based in Noblesville, has offered to donate architectural services, according to the statement. The crowdfunding campaign, called "Help Move the Kincaid House," will run until Sept. 30. Since it launched, Thompson Thrift pledged to contribute $20,000. The Hamilton County Tourism agency said it will give $45,000. As of today, $595 had been raised by online donors. "We&apos;re grateful for the community support that is rallying behind the house," said Mike Corbett, treasurer, Noblesville Preservation Alliance. "Without involvement from Nickel Plate Arts, Hamilton County Tourism, Navient, Indiana Landmarks, and Thompson Thrift, Hamilton County would have lost a major piece of history." If the campaign reaches its goal, the home is scheduled to be moved in the fall. What the farmhouse will be used for is not known. The Hamilton County Tourism office and other agencies will conduct a study to determine the best use for the house after the move. The public can offer ideas on the crowdfunding site. Want to help relocate the Kincaid House? Donate at www.indiegogo.com/projects/help-move-the-kincaid-house.